Clearly we have a filing solution for you. 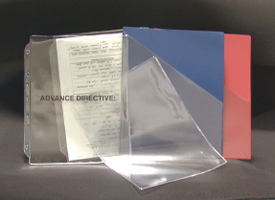 We offer a wide range of clear filing solutions and sheet protectors. Ranging from single pocket protectors to four pocket protectors, from fold-over closings to no closing to Velcro closing, we can produce any combination to meet your needs. There are many other styles available, but below are some of the most requested ones. We can also make custom filing solutions as per your specifications, and are capable of in-house die making. In addition to sheet protectors, we produce clear adhesive pockets to hold loose documentation, pictures, charge slips, identification cards and records. They can be applied to any smooth surface. Two hole punched for folder installation. 8 gauge clear vinyl. Heavy duty construction. 8 gauge clear vinyl. Heavy duty construction. 8 gauge clear or taffeta vinyl. Heavy duty construction. 8 gauge clear vinyl. Heavy duty construction. Custom printing available. 8 gauge clear or frosty matte vinyl. Heavy duty construction. Heavy gauge adhesive pockets can be applied to any smooth surface to hold loose documentation, pictures, charge slips, identification cards and records. CP94 Large Collection Pocket (2) 9-7/8" x 4-3/4" 9-7/8"
CP84 Small Collection Pocket (2) 8-3/8" x 4-3/4" 8-3/8"
CP42 Charge Plate Holder (6) 4-1/4" x 2-1/4" 4-1/4"
CP24 Charge Plate Vertical (6) 2-1/4" x 4-1/4" 2-1/4"
CP45 Picture Pocket (6/sheet) 4-1/4" x 5-1/2" 4-1/4"
CP15 Spine ID Pocket (6) 1-3/8" x 5-3/8" 1-3/8"
Preserve file spines and tabs with protective vinyl strips. Crack and peel backing for easy application to the spine and the tabs of manila folders. Available in many sizes to fit your needs.